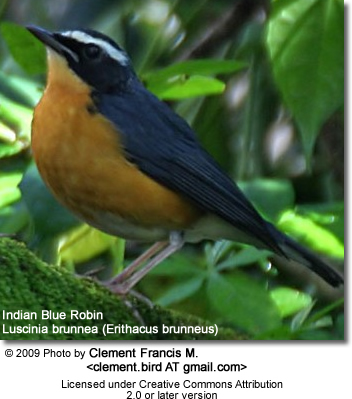 The Indian Blue Robin (Luscinia brunnea) is a small passerine bird that was formerly classed as a member of the thrush family Turdidae, but is now more generally considered to be an Old World flycatcher, Muscicapidae. It, and similar small species, are often called as chats. The bird is also known in the Indian subcontinent by its older name of Indian Blue Chat (Erithacus brunneus). It breeds in the Himalayas in India, and in Myanmar. The Himalayan population is migratory, wintering in the Western Ghats of southwest India and in Sri Lanka. The Myanmar birds are mainly resident. This species can usually be seen at wintering sites such as Victoria Park in Nuwara Eliya, skulking low in vegetation. This insectivorous species breeds in hill forest undergrowth, and winters in shrub and other lightly wooded habitats with some cover, again usually in highland regions. It nests low in dense bushes, laying 3-4 eggs. 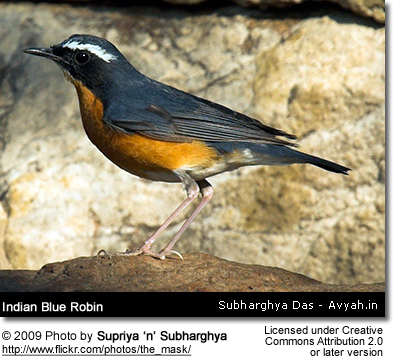 The Indian Blue Robin is similar in size to the Bluethroat at 15cm long. The adult male is a stunning bird, with blue upperparts, and underparts which are mainly bright orange with white on the lower belly and undertail. There is a long white supercilium (line above eye) and a black eye mask which flares out behind the eye. The female is much drabber, with brown upperparts and buff underparts, and white on the throat and belly. Young birds resemble the female, but the brown plumage looks scaly. The Indian Blue Robin has a simple musical song.